I used a metal honey strainer the last two times I prepared honey. I found that the honey ends up less clear, more particulates in it. I think the particulates are pollen. Is this a good reason for using a metal strainer? Pollen in the honey is good! The other explanation for my pollinated honey is that the honey I prepared with a cloth strainer last fall was from a honey super, while honey I prepared recently was from frames at the edges of brood boxes. Do bees add as much pollen to supers as they do to brood boxes? Lots of questions, but really delicious honey. Pollen is stored around the brood chamber thus is makes since that the honey from the brood chamber would have more pollen as it falls off their legs while they travel around. 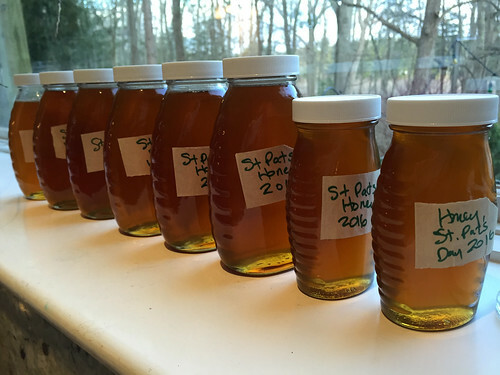 Since it takes a bit of time to let the honey cure before they cap it you get more pollen. Also they usually do not store pollen in the supers. If you think about it the honey supers are there for winter store when they are not raising brood thus they don't need the pollen, just the honey to move those wings. Either way the honey is yummy.